What’s the most ambitious project you’ve ever taken on? For me, there’s no doubt about it. Our 90 day content marketing challenge was the most demanding project of my career. 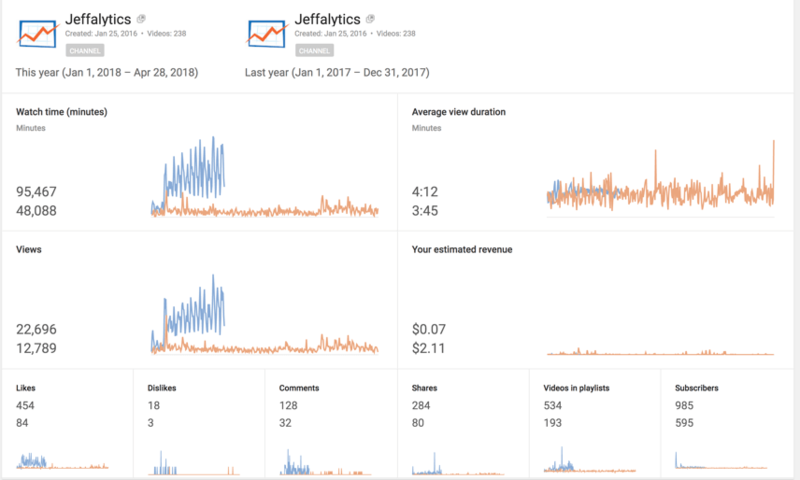 Between January 21st and April 20th, 2018, my small team at Jeffalytics created and released 90 in-depth digital marketing video tutorials on our YouTube channel. And along with every video, we published a detailed blog post. We covered everything from PPC advertising strategies to advanced Google Analytics techniques to how to build a digital marketing agency, and more. 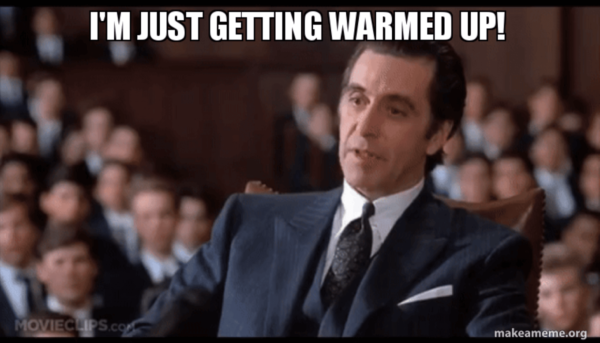 90 videos and blog posts published during 90 days. For those of you keeping score at home, we produced over 860 minutes of video footage and blogged over 100,000 words in just three months. This challenge was a grueling experience. So why did we take on this challenge? Why did my team and I spend 13 straight 70 hour weeks going crazy on producing detailed videos and blog posts? Well, the obvious answer is… Growth! We set some pretty lofty goals for 2018, and we decided the best way to reach those goals was to get out of the gate fast! So you probably want to know if this strategy that involved a mad dash of content marketing worked? Well, today I am going to share the results we’ve seen from the 90 day challenge so far. 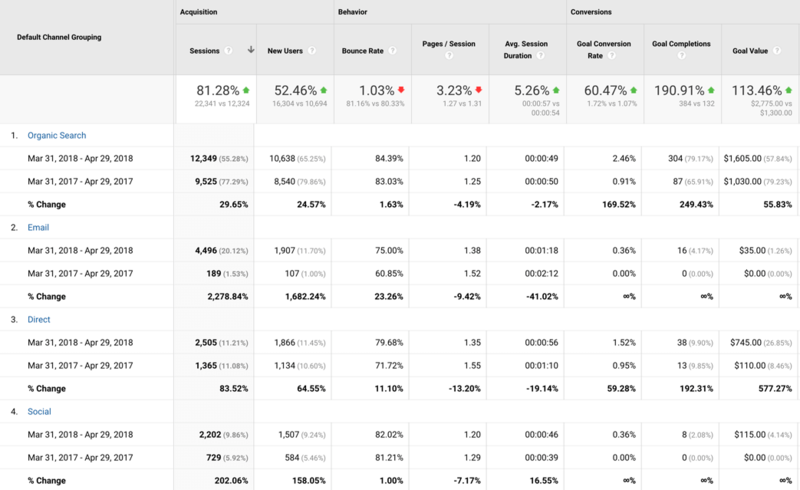 We’ll take a look inside our Google Analytics, Drip and YouTube accounts. I’ll show you how much progress we’ve made towards our 2018 growth goals. And we’ll talk about the impact we expect to see from the 90 challenge going forward. Before we get into the numbers, here’s a look back at our project management schedule from the 90 day challenge. Our Asana board provides a picture of how jam-packed our production schedule was. By the end of the challenge, our YouTube channel was just as busy. 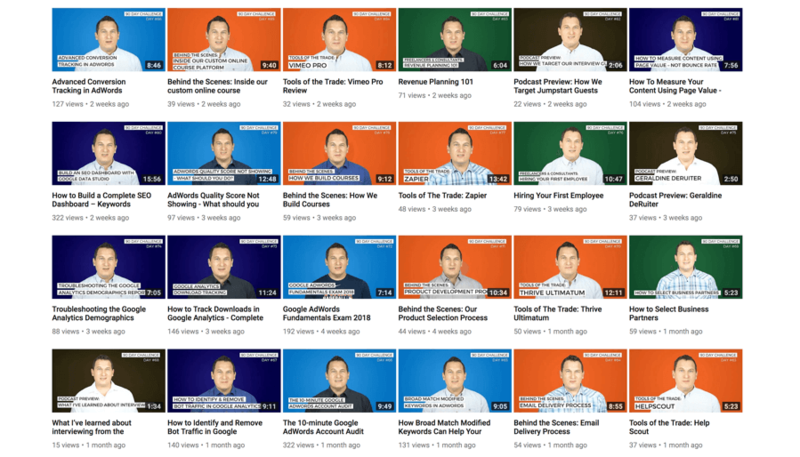 We turned our channel into a mosaic library of digital marketing knowledge. At the beginning of the 90 day challenge, I set some targets for our growth. Now before we review those targets, I’ll say this… I did a poor job at setting goals for the 90 day challenge. But there’s a reason why. I hastily put some numbers together to give us some rough targets, even though we were already working on the 90 day challenge videos and idea generation. Grow our YouTube channel from 1,000 subscribers to 5,000 subscribers. Grow our email subscriptions from 15,000 to 20,000. Increase our website traffic from ~13,000 monthly visits to 40,000 in 2018. As you’ll notice, these numbers are all rounded off approximations. It would have helped our evaluation process to be more specific with our targets. The analyst in me cringes at how I formulated our goals. But because we were short on time to get into action, these were the numbers we chose. Did we hit our 90 day challenge goals? Let’s take a look at the progress we made towards our goals starting in the first month of the challenge. I use Quill Engage for automatic updates sharing weekly and monthly traffic to Jeffalytics. These automated messages are a great way to keep an eye on our traffic stats while we’re busy producing content. And seeing our results get better every month helped my team stay motivated. Here’s our traffic numbers from January, just two short weeks into the challenge. In January of 2018 alone we increased our pageviews 81% over the previous month. 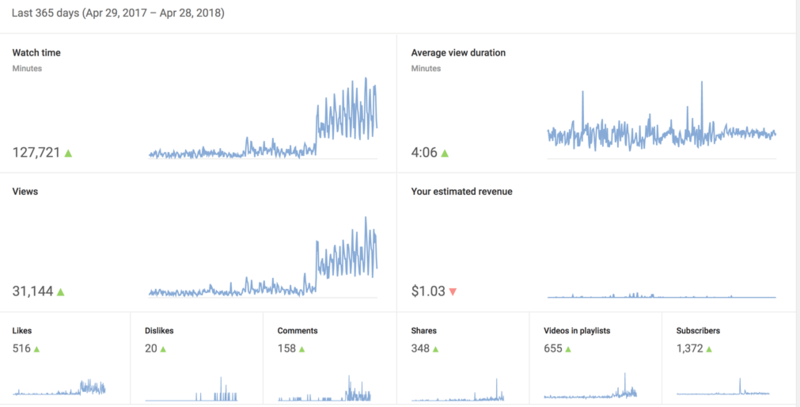 We also saw positive results on YouTube in January. 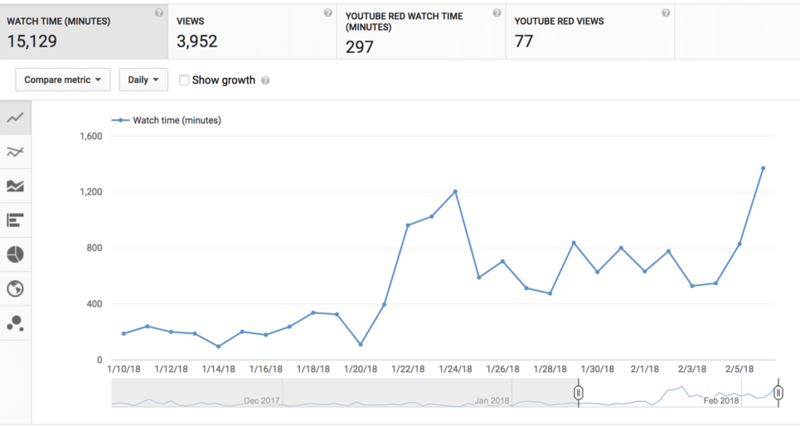 Announcing the 90 day challenge and getting our first couple weeks of videos live had a big impact. We immediately doubled our video views and added hundreds of subscribers. March was another strong month for the 90 challenge project. 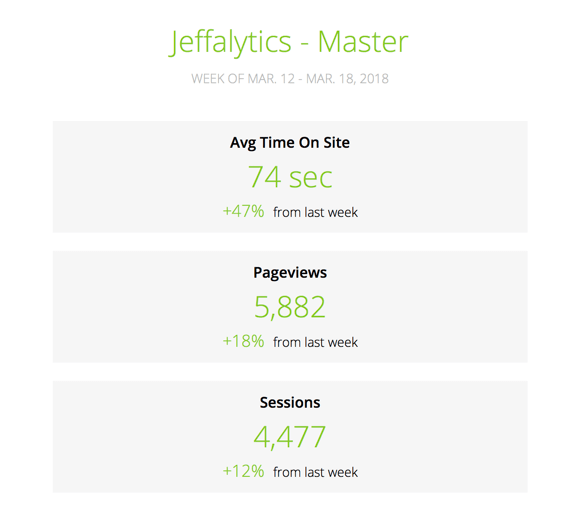 We increased pageviews and sessions to Jeffalytics again. 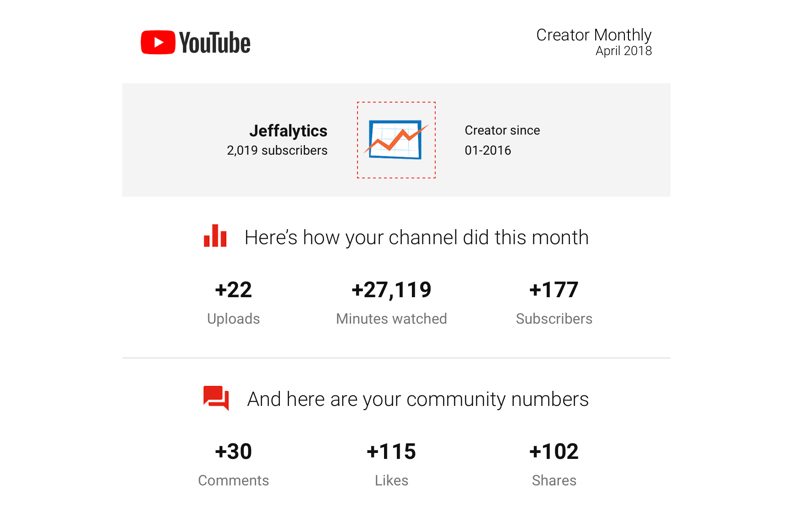 And in April, we saw growth across every significant metric for YouTube. We also saw increases in sessions and pageviews to Jeffalytics during the final weeks of the 90-day challenge. Those are some the positive results we saw during the 90 day challenge. But let’s take a look at the impact the challenge had on our overall goals. The 90 day challenge was the first time I’ve ever taken a regimented approach to publishing on YouTube. Our goal for our relatively young channel was 5,000 subscribers by the end the 90 day challenge. Well, we added over 1,000 subscribers. We doubled the number of subscribers we gained all of last year within three months. Our top sources of new subscribers, shown as “other” on the chart below, was our email list. The rest of our subscriber growth came from people finding our original content on YouTube and signing up to follow our channel. Our YouTube engagement saw a dramatic increase because of the 90 day challenge. It took us about 8 hours on average to complete a video and blog post for each 90 day challenge topic. That equals approximately 30 full 24 hour days of work. So far, people have spent the equivalent of 63 days viewing videos from the 90 day challenge! And that’s just the beginning of the return our work. Our engagement numbers will continue to grow as our content is discovered organically on Youtube and Google search. 90 straight days of publishing has already allowed us to double our numbers from all of 2017! Even though we fell short our goal of reaching 5000 subscribers by mid-April, the 90 day challenge videos will still help us achieve our goal. It’s going to take longer than 90 days, but our videos are being discovered by new viewers every day. As our engagement grows, I would expect to see an increase in our subscriber rate as well. I feel confident we’ll hit our subscriber goal very soon. Our goal for email list growth was to add 5,000 new subscribers. Let’s take a look inside our email marketing tool Drip and see how we did. Our primary email list for Jeffalytics grew by over 1,000 subscribers during the 90 day challenge. We added almost 2,000 new subscribers to our list. But as the frequency of emails increased so did the rate of our unsubscribes. Before the 90 day challenge, I was only sending a monthly newsletter to this email list. During the 90 day challenge, we emailed our list once to twice a week. So we lost more subscribers than we used to. But the subscribers that joined us and continue to follow along are the ones that really engage with what we are doing. We lost some quantity from our email list, but we rebuilt our list with new high-quality email subscribers. Our PPC Course email list grew by 1,000 subscribers. We had over 360 people sign up for an email list that was dedicated to 90-day challenge. These subscribers received a daily email about every video and blog post we published. As part of the 90-day challenge, we also created an evergreen email campaign. The subscribers that join our 90-day challenge email campaign get direct access to all 90 videos and posts, starting from day #1. And, even though the 90 day challenge is over, we still see three to four new subscribers join this list on a daily basis. There’s also one more major email related growth metric I’ll share. We generated 8,700 new sessions to our website by emailing the subscribers on our lists. 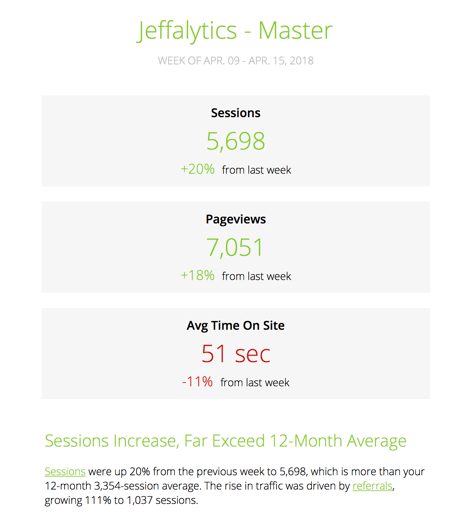 Increasing our email frequency from monthly to weekly created almost 6,200 net new sessions to Jeffalytics. We added approximately 2,500 net new email subscribers. A lot of the content we created is still growing and generating new email sign-ups. So I have no doubt the 90 day challenge content will push us to our 5,000 new subscriber goal in the next month. Overall we wanted to grow our traffic to our network of websites by almost 30K monthly visits during 2018. And so far the 90 day challenge is paying dividends. During the final 30 days of the challenge, we hit 22K sessions on Jeffalytics. Looking at our traffic numbers in Drip, we can see our baseline from December was about 10K new visitors to Jeffalytics. In January we grew by 7K new visits. We saw a big spike in our traffic following a Tweet from Rand Fishkin about the 90 day challenge. That tweet alone drove about 1,000 unique visits. If we normalize our data for the Rand Fishkin Twitter spike, we can see that we continued to grow in February. 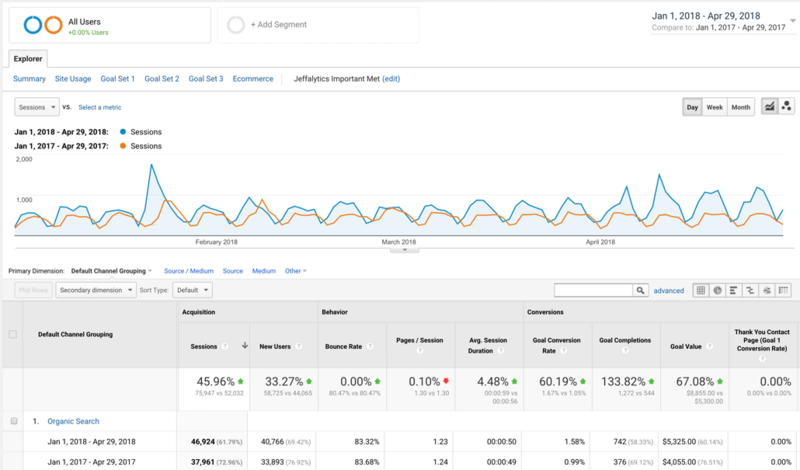 In March, we also added more new traffic than we had previously seen. Then in April, as our content started to build organically, we hit over 18K new monthly visits. 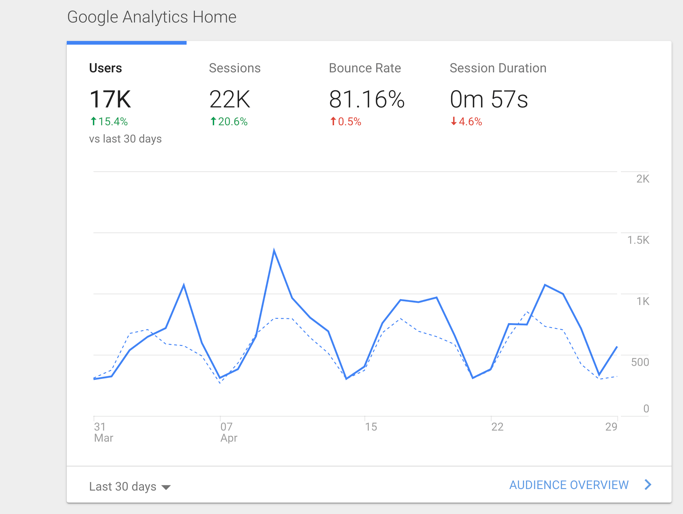 A comparison of April of 2018 versus April of 2017 shows the impact the 90 challenge is already having on our traffic numbers. If we break down our traffic by source, we can see that all of our major numbers are up. Our organic traffic has already grown by 30%, and a lot our content is still climbing the search rankings. Our social media traffic is up over 200%. I mentioned earlier that 90 day challenge helped create a more engaged email list. And as you can see our traffic from our email list is way, way up! Organic search performance for January through April shows the real impact of the 90 day challenge on our website traffic. If we look at our traffic versus the previous year, you can see the new trend. During March and April of 2018, we saw distinct growth in organic search numbers. 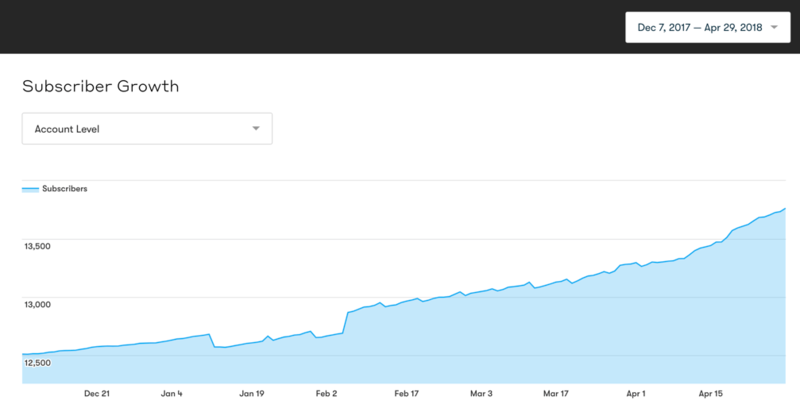 And that growth continued to build even after we stopped hitting the publish button. 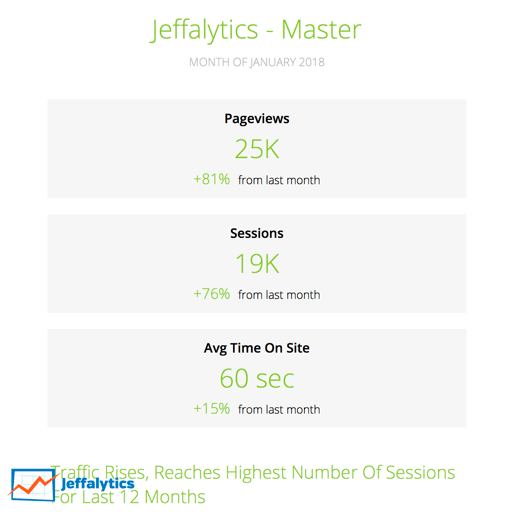 Overall, we increased sessions to Jeffalytics by 24K year over year. That’s 46% increase in traffic so far this year! Also, these traffic numbers only account for increased growth on Jeffalytics. Three of our seven weekly 90 day challenge videos and posts were hosted on our course sites, not jeffalytics. If I factor in the growth our course websites saw, our increase in traffic is even more significant. Overall I am really pleased with the growth we’ve seen from the 90 day challenge. But there’s also an intangible silver lining to this project. Our videos and blog posts will bring in new traffic for years to come. So, it’s actually too early to judge our results. Just recently we’ve seen content we created in February move up from being buried in the SERPs to the top of page one. So it’s too early to call this contest yet. Also, the 90 day challenge has given our production process loads of momentum. Producing new videos and blog posts used to take us days if not weeks of work. Now, my team members all know their roles, and we crank out new technically in-depth tutorials and updates in one to two days. We’ve really sharpened up our production process. And optimizing our production process was what this challenge was all about. We wanted to hone our skills, and get better quickly so we could take both our premium courses and free content to the next level, quickly! We’re not going to continue our crazy seven days a week publishing schedule. But if you’ve been following along with our GDPR updates, then you know we are going to keep going. We are going to continue to bring you in-depth marketing tutorials and updates. And we are going to double down. We are going to make the resources we already created even bigger and better. So, yes there’s more to come. I planned on talking about the lesson I learned from the 90 day challenge in this video and post. But, I think that’s going to have to wait until next time. So if you haven’t already joined our email list, sing up now to hear more about our results. In the next couple months, I’ll share all the lessons I learned from our crazy, over-ambitious 90 day content marketing challenge. 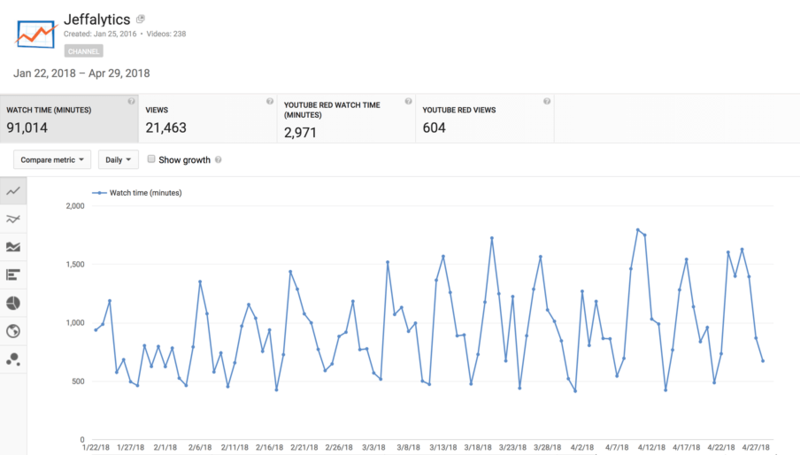 And we’ll take another look at our stats to see if our traffic, email list, and YouTube channel are growing. We worked hard to target our content before we started the 90 day challenge. But you never know how things will ultimately work out. Will we see increased growth in the months ahead? Or will our numbers plateau once we stop publishing every day? Weigh in with your thoughts in the comments below? And if there’s something you want to know about the 90 day challenge, leave a comment with your questions. We’ll feature the best questions in our next 90 day challenge update.